Peeling away the layers of the world's first mass-produced electric car. Our friends at Motor1 got their hands on a cool drawing of the world's first mass-market electric car. Ok, sure, some people will say that the EV1 never sold enough units to really be mass-market, but for our purposes, let's just say it was, mmmkay? That'll let us focus on the coolness of the image here, including the powertrain and two-seat passenger cabin. Turns out, artist David Kimble was given access to the horribly named Impact concept (which became the EV1) starting in 1993 and drew these cutaway sketches based on visits to multiple GM locations as well as photographs shot by Neil Nissing. The sketch you see above (and can see in larger form over at Motor1) is based on the final, production version EV1. That electric pioneer came to market in Southern California and Arizona in 1996 at a cost of about $55,000 in today's dollars. If you leased on (there was no purchase option), you got an EV with a range of 60 miles thanks to lead-acid battery technology. A NiMH version with a longer range was introduced in 1999. 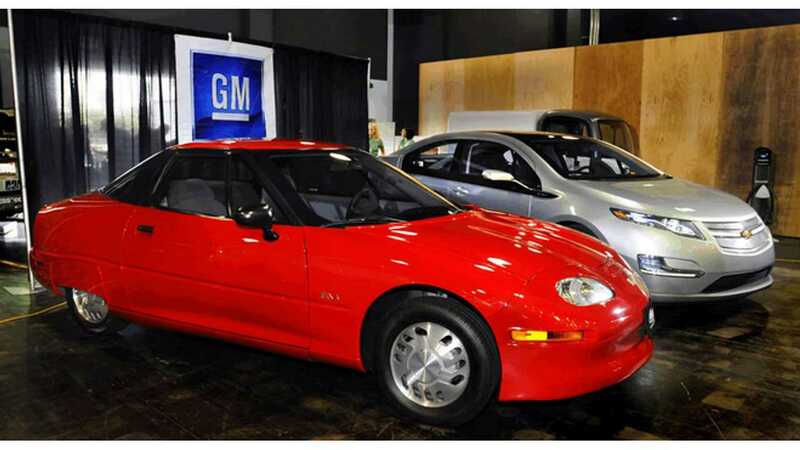 Today, the EV1 is mostly known for being crushed by GM (see the film Who Killed The Electric Car?) and is now a museum piece. If you can't see it in the movies or behind a velvet rope, take a good look at the cool sketch above. Peeling away the layers of the world’s first mass-produced electric car. It’s 2017 and electric vehicles are on the cusp of going mainstream. Nearly 625,000 EVs and plug-in hybrids are already on the roads of America, and with advancements in battery technology regularly chipping away at range anxiety and charge times, now is the time to remember the car that took the pioneering step into the EV realm. We’re speaking of the General Motors EV1, and as we continue our series featuring the exquisite automotive artwork of Mr. David Kimble, there’s never been a better time to take an exclusive look at this pioneering machine. Even in print form, the EV1 is something special. That’s because Kimble didn’t do a single EV1 cutaway sketch. Beginning in 1993, the automotive artist had multiple visits with GM to capture the Impact concept car, its components, and the production-ready EV1. Keen to show the world that its vision of an electric car wasn’t a glorified golf kart, GM opened the proverbial floodgates for Kimble and photographer Neil Nissing. The pair shot complete cars and battery packs in Detroit, electric motors and components in Anderson, Indiana, and the power control system in Torrance, California. Mind you, these were just for the 50 test cars built from the Impact concept – when the EV1 was production ready, Kimble did it all over again. Those efforts led to multiple sketches that detail both the car and its powertrain. 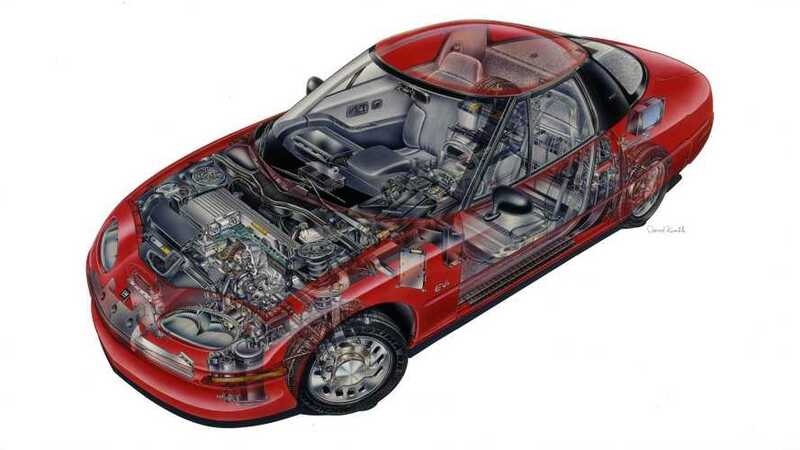 As such, the cutaway featured here is the final product of all those efforts – a two-layer illustration of the EV1 featuring the powertrain mostly visible through the interior and body. Check out the full article at Motor1 here.